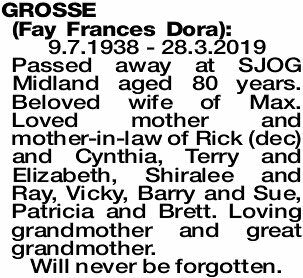 The Funeral Service for Mrs Fay Frances Dora Grosse of Mundaring will be held in Bowra & O'Dea's Chapel, cnr Great Eastern Highway and Robinson Road, Bellevue commencing at 2.00pm on MONDAY (8.4.2019). 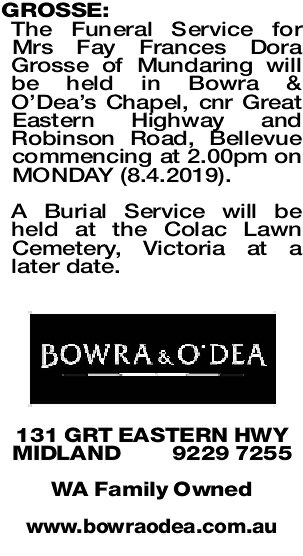 A Burial Service will be held at the Colac Lawn Cemetery, Victoria at a later date. 9.7.1938 - 28.3.2019 Passed away at SJOG Midland aged 80 years. Beloved wife of Max. Loved mother and mother-in-law of Rick (dec) and Cynthia, Terry and Elizabeth, Shiralee and Ray, Vicky, Barry and Sue, Patricia and Brett. Loving grandmother and great grandmother. 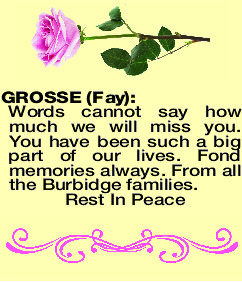 GROSSE FAY Words cannot say how much we will miss you. You have been such a big part of our lives. Fond memories always. From all the Burbidge families. 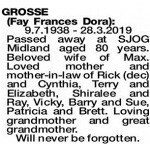 GROSSE FAYE Many wonderful guiding memories.